Sony's 3-D Bloggie video camera, which goes on sale later this year, employs two lenses to create three-dimensional images. Editor's Note: Follow @cnntech, @jdsutter and @markmilian for Twitter updates this week from the Consumer Electronics Show. Join real-time discussion with CNN iReport at @cnnireportPRJCT. Las Vegas, Nevada (CNN) -- Louis Rousseau shot his family Christmas in three dimensions -- his relatives jutting out of the digital videos when viewed on a special TV with special glasses. "It's really dramatic -- it's fun," he said. "You see wherever people are sitting, exactly. You see the depth of the picture -- it's actually like you're looking at the scene." Against some obstacles, companies like Sony, Panasonic and Fujifilm are promoting the idea that people should shoot their home movies and family photos in 3-D.
At the Consumer Electronics Show in Las Vegas, where many of the year's tech trends are set, companies have unveiled new lines of 3-D cameras and camcorders. They range in price from about $200 to more than $1,500, and they use two lenses or software tricks to create images that appear to pop out of the screen -- but only when viewed on a 3-D TV or laptop, and usually only when the viewer is wearing 3-D glasses. The gadget-makers' aim, in part, is to make up for a lack of professional 3-D content by supplementing it with three-dimensional content shot by you and me. YouTube is encouraging the trend, too, since it has a 3-D video channel for uploads. Reviewers and consumers have complained about the costs of those TVs; and some say the images are headache-inducing. These concerns have led to much skepticism about consumers shooting home movies and photos in 3-D, too. "It's all just kind of a gimmick right now and I don't think it has any long-term staying power," said Ryan Block, co-founder of the website GDGT. Amateur 3-D photographers may be part of the problem, too. Think about what it's like to watch your relatives trot down the street or ride in a car in a home movie. The shaking. The nausea. Now amp that up a few notches with 3-D tacked on. "It's very easy to make 3-D, but it's very difficult to make good 3-D," said Gary Merson, editor-in-chief of the blog HD Guru, which covers television. Consumers who aren't familiar with the current limits of shooting 3-D video may create images that could make the viewer feel like "a fish looking two directions," he said. Still, electronics makers are pitching 3-D cameras as a way to enhance family photos and videos. They released a range of camera models at CES, from a product designed to shoot 3-D Web video on the go to 2-D cameras with 3-D add-ons. The companies maintain shooting home movies and photos in 3-D improves them. 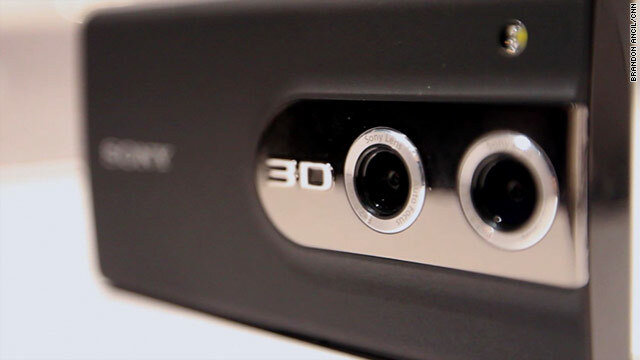 "3-D adds realism," said El-Deane Naude, product information manager at Sony, which has seven new 3-D cameras at CES. "People see in 3-D. People don't see in 2-D."
Companies also say 3-D isn't just for family occasions. Any situation where there's a large distance between the foreground and background will look nice, they say. Jack Salamanchuk -- a trainer with Panasonic, which also announced a line of 3-D-capable cameras, with the video cameras starting at just under $1,000 -- said his favorite place to shoot 3-D movies is the zoo. "When somebody sees a clip of an elephant coming at them, it tends to provoke a reaction," he said. Salamanchuk said it's not difficult to shoot a good 3-D movies. The two most important elements are good lighting and a tripod. You don't want the image to shake, he said. The camera makers go about producing 3-D images in various ways, and consumers would need to learn different techniques in order to produce the images. Panasonic sells a two-lens add-on that screw on to the front of some of its camcorders and still cameras. The lens has a few controllers that allow users to increase of decrease the degree to which images jump out of or sink back into the screen. He called these effects "positive z" and "negative z." A Sony camcorder has two lenses and two light sensors built in, which the company says creates images that are twice as sharp as those produced with an add-on. These camcorders don't have "z" adjustments, but users can switch 3-D recording on and off. Likewise, they can view a version of the 3-D images, without wearing glasses, on the camera's viewfinder. Still cameras are yet another story. Sony's still 3-D cameras have only one lens but use software and shooting tricks to create dual images that are stitched together to create three dimensions. One version requires consumers to click the shutter and pan across a scene, creating a 3-D panorama. On another Sony model, users click and hold the shutter momentarily without moving to create the effect. After that, there are issues with editing and viewing 3-D images. Consumer-level movie-editing software generally doesn't support 3-D -- at least not yet, said Naude, but he expects that to change in the near future. Plus, you have to have a device that lets you view 3-D content to see the pictures. That's a big limitation, said Block, from GDGT. "What are you going to play it back on," he said. "Can you be sure that the people you want to share this content with are going to be able to view it? Not every TV has 3-D -- and those that do don't even look very good." Sony offers at least a partial solution with its $250 3-D Bloggie video camera, due out in April. Users can upload 3-D videos to the internet and anyone view them online with a pair of standard red-and-blue 3-D glasses, which cost about $2, said Naude. Now "grandma can experience her grandchildren in 3-D," he said. You'd only need to send her a pair of the cheap 3-D glasses. It's unclear exactly how mainstream 3-D cameras will become. Salamanchuk, from Panasonic, said it's a niche market for now. "I'm not going to pretend there's a large market yet -- because there just isn't. I think for things like wedding photographers there's a big market," he said. Sony expects consumers to dive in to home movies in 3-D.
"Once somebody buys a 3-D camera, it becomes the norm to you," he said. Rousseau, who shot his family Christmas in 3-D with a Fujifilm camera and works for Sensio, a company that makes 3-D technology, said he sees the benefits to shooting home movies in a third dimension. His family gathered around a 3-D TV to look at the photos, he said. And the pics had a little extra pop.